Easy weeknight dinners are a must with busy schedules. And as you saw last week, I have several criteria for weekday dinners - and this one meets all of them. Plus, it's another way to cook chicken. I'm sure you'll agree that we all need some variety when it comes to making chicken! I was excited to be assigned to Debbi's blog for this month's Secret Recipe Club. 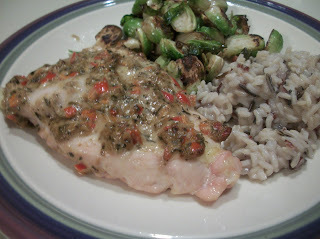 She has lots of great, healthy meal options (she even named her blog Debbi does dinner healthy! ), and she's also the lovely hostess for our SRC group. This was a big hit with my family and I even used the leftovers in soup. I served it with a rice medley and roasted brussels sprouts - the veggies can roast at the same time the chicken is cooking - super handy! Expand your chicken repertoire with this great recipe and make weeknight dinner delicious and healthy. In a small bowl, stir together the mayonnaise, red pepper, garlic powder, oregano, basil, parsley, red pepper flakes and vinegar. Arrange chicken on a large rimmed baking sheet and spread mayonnaise mixture over each chicken breast. Bake at 425 for 20 minutes or until chicken is cooked through. Serves 6. So glad you liked this! I had your blog too and looks like we both made chicken! I loved looking through your recipes!! This looks like something my family and I would enjoy. I can imagine how moist it was, and I love the idea of cooking everything at the same time in the oven. Yum! Sounds really good. I love anything remotely italian and this seems perfect for a quick meal. 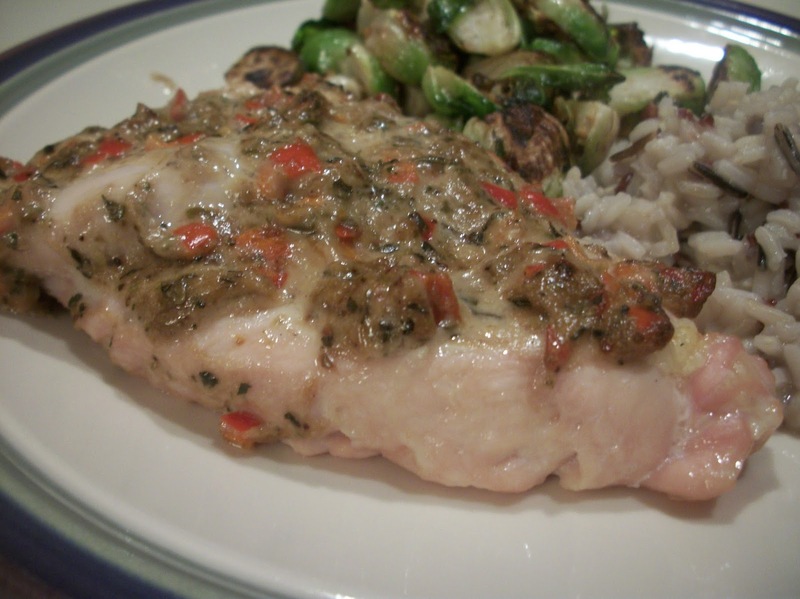 Looks delicious for a weeknight meal or even a weekend dinner party. Visiting from SRC C! I can imagine that chicken was super moist. Looks delish. And great idea to use the LOs in soup.